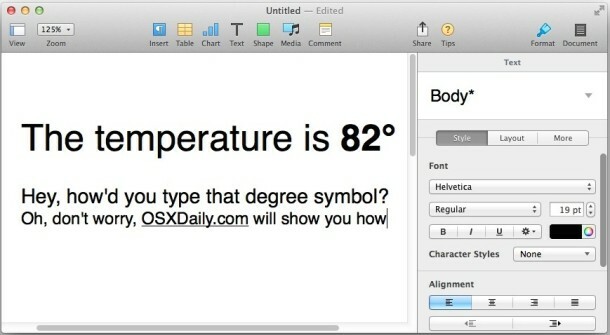 Ever wondered how to type the temperature / degree symbol in Mac OS? Typing the degrees symbol on a Mac, or any computer, may seem like a giant mystery since it’s not immediately visible on any keyboard, but it’s really quite easy if you know the proper keyboard shortcut. These keystrokes are universal and supported by everywhere you can type in Mac OS X, it doesn’t matter what app you’re in on the Mac. As long as there is a text entry point, you can type the degree symbol, be it in Pages, Messages, Word, Safari, Chrome, or any other text editor or word processor. To try this out yourself, open any Mac app where you can type, like Messages, Notes, TextEdit, Pages, Microsoft Office. That’s it, you can use either keyboard shortcut to type the temperature degree symbol. Personally I usually use Option + Shift + 8 because that is what I tend to remember the easiest, but use which works for you. By the way, you can also type the degree symbol in iOS on your iPhone or iPad with a little keyboard trick too. This is simple stuff though right? Well, I just got an email from a relative who was clearly very frustrated that they couldn’t figure out how to type the degree temperature symbol in Mac OS X. I laughed about it for a second but then realized I’ve been asked this question a few times before especially from recent switchers, so clearly some of the simple things just need a simple explanation. Happy temperature telling, and enjoy your weather whatever it is! What’s the Difference Between the 3 Degree Symbols on Mac? You may notice there are two keyboard shortcuts and each of the two temperature symbols are slightly different, but I couldn’t tell you why or what for (perhaps one for celsius, fahrenheit, and kelvin? ), so some people just use which ever one they want, or maybe whatever symbol is easier to remember with the keystroke. Interestingly, if you run the text-to-speech engine on the Mac over both of the degree symbols, the OS identifies both as “degrees” with no differentiation between the two. Perhaps the difference is only visible, with one degree symbol being slightly smaller than the other. But aside from that, if it’s 35˚ outside, now you can tell someone without typing out the full word ‘degrees’, and that’s a bonus, right? Thus you technically would want to use Option + Shift + 8 for degrees relating to temperature, but visually the other symbols look quite similar even if they are different. And again, if you run text-to-speech on the Mac with those symbols, all are identified and spoken as ‘degrees’ which makes that an interesting thing to note. And if you know of any other method of typing out the degree symbol in Mac OS, share it with us in the comments below! You can use Option + 0 too. option + 0 is the EASIEST. please update. The correct degree sign is Option+Shift+8. Option+K makes a diacritic “ring above” character, and Option-0 makes a “masculine ordinal indicator”. Yes. Thanks for clarifying this. They are different symbols, and depending on the font they can vary quite a bit. These are really not the same. Isn’t there a list of most special characters for each keyboard layout somewhere at apple.com? º˚øØ°• lots of weird symbols, lol, i dont know what any of these are! temperatures? are they farhenheit vs celcius vs kelvin temperature? why so many symbols? the funny thing is on a PC in windows i dont have ANY idea how to make ANY symbols! so much easier on a mac, everything is. On a PC, ‘charmap’ is a utility that shows the mappings for an given font, the reference being arial for double-byte fonts. hold alt + 0176 on the keypad and you get character 176, which is a degree symbol. Mac OSX has a character pallette – cmd+opt+T, but it’s light on the keystroke details you need for a given character. You can copy characters, though. One could also use system preferences/international/input menu/”show input menu” checked. it might be slightly off-topic, but is there a shortcut for the “square” symbol too? til now I had a workaround to the job for me (quicksilver, copy-paste the character).. if you need m², cm², x² … a lot a “native” osx key-combo would be fine (for 3 as well?). Very helpful. Not all sites that try to solve this problem actually provide the correct solution for Mac OS X. Thanks! Characters in Unicode do have a meaning and whilst they may render similarly on your screen another person may perceive them differently. which makes it clear that °ª are made to be seen as a pair. They are used in Spanish where instead of 3rd (“third”) one says 3ª (“tercera”) and instead of 1st one says 1° (“primero”). You can also tell if you’ve used the correct degree symbol because HTML will render it as °. oops. It will render as & deg ; = °. “Simple?” Not if you don’t spend all your time futzing around with the computer. It doesn’t come with a manual and the “Help” feature is really not very helpful; that is, it doesn’t always have all the answers. Awesome…I have to look this up every time I need it! Option+Shift+k was working just fine, then a strange thing happened. Option+Shift+k now gives me the Apple apple . What Happened??!!?? This is on standard US English keyboard.